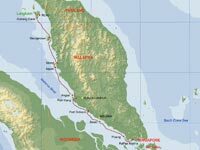 The distance from Singapore to Langkawi is only about 350nm, but it took us 8 sailing days, in addition to days spent in marinas. Because of very light winds we had to motor all the way. The coast is rather flat and uninspiring, with few sheltered anchorages, which called for long days, pulling up the anchor before day break and dropping it again 50-75nm further to the NW at dusk. I have to admit that a slight feeling of boredom, was experienced a few times on this trip. Night sailing is not encouraged because of the frenetic fishing activities. 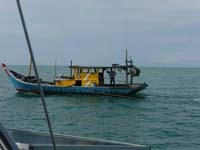 There are thousands of small fishing boats moving around particularly at night and all kinds of traps litter the coastal waters. 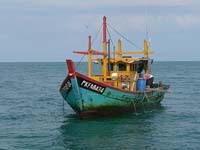 Many of the local boats lack lights or carry confusing light combinations. There were thunderstorms every night and on most days with terrifying lightning. At three locations we stayed in marinas: Port Dickson (near the old city of Melaka), Port Klang (which is the port of Kuala Lumpur) and Georgetown (on Penang island). From these marinas we made some land trips to interesting sights nearby. A peaceful sunset at Angsa island. We didn't see any pirates and we have not heard of anybody else encountering any either, and all people we met were extremely friendly. Instead we heard in the news about the ever increasing piracy outside the Somali coast, now apparently spreading over a much larger area than before, even in the vicinity of the Seychelles. Malaysia is the product of a complex colonial past. 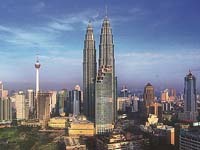 It's population of 20 million is a mix of Malays, Chinese, Indians and indigenous peoples. The mix has led to racial tensions in the not so distant past, but we didn't see any evidence of this problem. 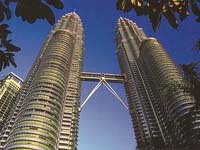 Until independence in 1957, present day Malaysia was three distinct British colonies: The Federated Malay States, Sarawak and British North Borneo. At the start of independence Singapore was part of the Federation, but it was expelled in 1965. 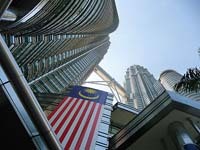 Today Malaysia is a stable regional power which is modernising fast while still retaining much of its tradition culture. Its constitutional charm is an elected monarchy, though the electors ar the state sultans themselves (Southeast Asia Cruising Guide). 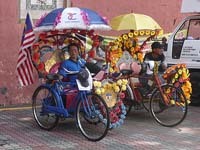 Local transportation in old Melaka town. On this trip we were in company with Rudi and Lilian on the Swiss yacht Shiva. There were very few other sailing vessels around and there was always plenty of space in the marinas. Usually we prefer to anchor out, partly because of the expense, but mainly because the breeze makes it a lot cooler than in marinas. Before Nongsa Point Marina (report #56) we hadn't stayed in a marina after Cairns in May. However, because there are so few sheltered anchorages on this coast, we now used all the marinas available, and the fees were very reasonable. But we had 30+C in the cabin all night although the fans were working hard. Admiral Marina at Port Dickson was again a five star establishment combining the marina with a hotel and country club in the same style as Nongsa Point Marina (Batam, Indonesia) and Raffles Marina (Singapore). 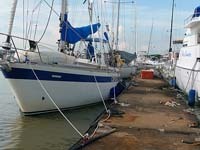 Royal Selangor Yacht Club at Port Klang was, however, a very different experience. The clubhouse was stylish and the people, as always, friendly, but the docks were very run down and dirty. In Port Dickson we rented a car with Rudi and Lilian and drove to the old town of Melaka (or Malacca), with colonial buildings from the Dutch period and some well preserved old ornate oriental architecture around the old harbour. 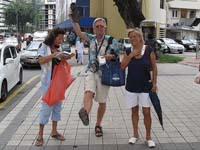 Malla with Lilian - tourists in Kuala Lumpur! Old colonial buildings, obscured by a bus. No worries, help is close! 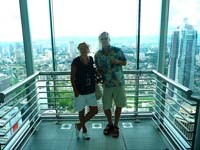 452 metres is high enough, but luckily we were not allowed to go higher than to the Skybridge connecting the towers, which can be seen on the photos above. On the passage between Talang and Georgetown we could often count to more than 200 fishing boats in sight at the same time! There must have been close to a thousand in total that day. 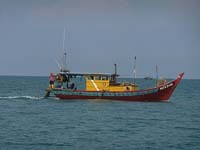 This time most of them were towing some kind of small trawls although usually they are laying out nets. Unfortunately all along the coast the waters are full of debris and trash, and we were very sad to see how the human race is destroying the environment. Swimming was not an option, despite the heat. 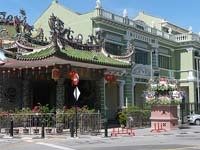 Penang is an interesting place, also with a colonial history. The Capital of the island is Georgetown. 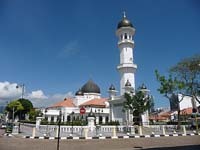 It used to be the administrative centre of Malacca before Singapore took over that role. 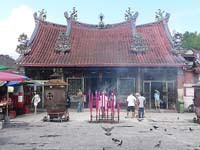 There are many restored old buildings and a mixture of different temples, mosques, churches and other religious structures as well as very enjoyable versions of Chinatown and Little India. We really liked Georgetown and could easily have spent a longer time, but we were now only a (long) days sail away from our goal Langkawi and were looking forward to the swimming in cleaner waters. The Tanjong City marina does not have a good reputation among cruisers, but the recently built floating breakwater has reduced the surge caused by ferries and tidal currents, so we didn't think it was too bad. The marina in Georgetown at Penang island is called Tanjong City Marina. After three days in Georgetown we let go of our dock lines before daybreak for our last long day of this journey, 65nm to Langkawi. Ten hours later we dropped the hook in a scenic area called "The Fjords" (photo above right): it was time for a swim! 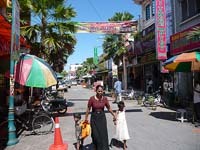 The next day we sailed to the town of Kuah, Capital of Langkawi. I am posting this report at Royal Langkawi Yacht Club at the end of October 2009. 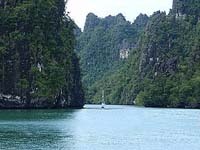 We will be staying in Langkawi for 6 weeks before we move on to Thailand. See a slide show (manual) of some of the photos of this report HERE. Some anchoring information can be found HERE.